I've spent some of my morning just analyzing some of Tim's performance to see what I can learn. I love charts, tables, and analyzing results, especially if they look good. Tim does have enough data points of 376 trades in the past 28 months of trading. What am I learning from these results? Tim optimally trades in the $1.01 to $5.00 range. He has great results and the most consistent there. He typically takes profits around the 8-9% movement. It seems when he goes to more expensive stocks, he tends to be less successfully consistent. He's confirming that the small hits on a regular basis over time helps build a good size account. He shows reasonable discipline, regularity. I cannot say what his trading strategies or plans or as I don't have his DVDs or watched him trade. But, these are impressive real life results. I know that Tim has his stats on his site, but I wanted to see a few things more regarding his stats. Being a number's person, this was interesting. He started trading in his account with around $12,415 in Feb'08. He made a total of 17 trades, 5 of them costing. 70% of his trades went in his favor. 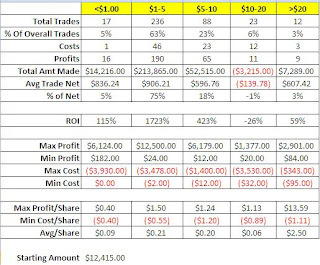 His profitable trades were $2881 and costing trades were $820 with a net of $2061. Not sure if in what he reported, this included commissions or not. It would've been nice to see how much money he put into each trade. His avg costing trade was $164 and his avg profitable trade was $240.08, so if 70% of his trades are in his favor and 30% aren't, those are GREAT stats. Of the past 29 months, he made trades in 28 months. Somehow he either didn't trade in Oct'09 or forgot to put the data in his website. ROI = 2293% in 28 months of trading ----> Pretty amazing if you ask me. His lowest month was 46% of trades in his favor, with only 4 out of the 28 months under 60% of trades in his favor. Wow! Of those 28 months, only 1 month was negative. Another month he netted $2.00. All the other months he made more than $100. As a single mom with a lot on her plate and haven't truly made it in trading, I know that trading is a whole lot more than just the mechanics of it. As one who now does not have much money to trade AGAIN, it's not really a shameful thing. I've heard it said that when we do not learn our lessons, they keep repeating themselves. Unfortunately, it's not as simple as Groundhog day where you get another chance to do the same day over and over again until you get it right. Someone that has intrigued me a great deal is Tim Sykes. He really hit it big as a kid turning a small account into millions and then becoming a fund manager when he became an adult, but bit the dust. 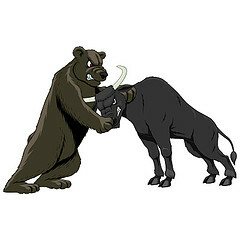 Now, for the past 3 yrs or so, he's been into pennystock investing and totally tauting this. He seems to get on the nerves of a number of people and traders. Perhaps most real traders do not take pennystocks seriously and when I look at the penny penny stocks, they scare the dickens out of me. I can't find a definite pattern other than sheer utter chaos. I rely on technical patterns and if it looks like a Reeses monkey on heroin drawing the chart, that's pretty scary. How do I feel about Tim? I think he's cocky, arrogant, obnoxious. But, there seems to be this lovable thing about him that attracts me to perhaps his will to thrive and to "show 'em"! Or, the "I'm going to prove you wrong" attitude. I can't say that I've extensively followed Tim, but I do admire his perseverance and his ability to be creative, go out on a limb, market himself after the blowup with his hedgefund. I think it takes courage to publically bite the dust so hard and to come back somewhat crawling on your hands and knees, humbled, and to rebuild things, not expecting miracles, but doing things differently, learning from your past successes & failures, changing. Yes, Tim does have a big mouth. Maybe that's his personality. We all have our own quirks. Looking at things with him, he gets a lot of criticism for all sorts of things like having a subscriber list, selling DVDs, and maybe having other monies to help fund things. There's probably more that he gets bashed for, but these are the things as of late that I've read. As I look at his results, he puts his trades out there for others to see, his results for each stock. One cannot deny the results. They are actual trades with actual profits & losses. He also says that he's not that great of a trader, but he does do some things that good traders do, I suspect. It's smart of him to also capitalize on other ways to generate income, which he does through his website, subscribers, book, DVDs and whatever else he chooses. This is perfectly alright as this is a part of capitalism. I'm not sure why others bash him for this as there are many other people who run internet businesses also and it's perfectly alright for them to do so. Too bad I didn't do this years ago, because if I had, I probably would still be trading at this moment as some of the pressure would be off me as trading being the only source of income for the kids and I. That's big pressure. However, that's not where I was then in life and was not opened to hearing about it. Thought all I needed was trading. Guess I was wrong. Hard lesson to learn. One of the good things about pennystocks or stocks in general are once you own them, you own them and there are no expiration dates or time value to fool around with. Tim also seems to close his trades not looking for the homerun, rather just looking for 1 base at a time. If he needs to walk, he'll walk. He takes no shame in how he gets his profits. A bunch of small profits lead to big profits. Take your costs when your trade turns against you. 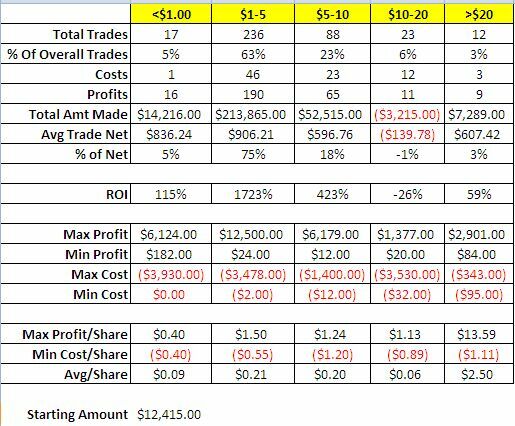 So far, Tim has published 112 trades' results with an 86% of his trades profitable. That's REALLY good. Better than my 80%. His net profits are $204,076 and net costs are $21,767. He keeps his costing trades fewer and smaller than his profitable trades. Sounds like a good trader to me. This isn't like he made 3-4 trades and he's on the winning side, but this shows a pattern of consistency with 112 trades and these odds. This is just for the first 1/2 of 2010. I'm excited to see how he will fair for the remainder of 2010. It would be so cool to see him be able to make $400K+ in the next 6 months, which would bring his net for 2010 to $600K+. Well, Tim, if you're reading this. I'm all for you, minus the swear words. Hope you make millions and keep it. For the example prior, never at any time is the whole account traded, even in the early stages when there is little money. Stops are always set and managed. There is no hope. There are defined trading plans & strategies that are implemented. The topic of the lottery is greatly on my mind. Is playing the lottery a good thing, especially if you're a Christian? How are the statistics of being struck by lightning derived? Are the number of storms that have lightning documented, as well as the number of people within those storms? Then, you take the number of people killed or injured when struck by lightning? However, what were each of these people doing? I'm sure there are other variables that play into being. Certain areas of the U.S. probably have a lower chance of being struck by lightning than other areas. And, probably a big one is what you're doing - whether you're making yourself more susceptible to being struck than not. I read somewhere that the 2000 U.S. Census population was 280 million. Yes, that was 10 yrs ago and it's more than that now. It said the odds of being struck by lightning is 1/700K. Somewhere else I read that to win the Lotto, which is 40 balls and 6 are chosen, the odds end up being 3,838,380. The math is: 40 x 39 x 38 x 37 x 36 x 35 = 2,763,633,600. This is for the 6 balls and possibilities. Because the order of the balls does not matter, you divide that # by the 6 possibilities: 6 x 5 x 4 x 3 x 2 x 1 = 720. I have a friend who does about $10/month. This would be 3,838,380/10 = 383,838. Thus, his probability of winning is 1/383,838 = 0.0000026. Whether you look at it from the odds or probability, it doesn't seem very good. For example, if you flip a coin, your probability is: 1/2 = 0.50. That's really good. The odds of getting struck by lightning in 2000 were 5.5 times more likely than winning the lotto. Personally, I don't know anyone struck by lightning. And, you could probably increase your chances of being struck by lightning by standing on a hill as being the highest point and carrying a long metal rod during a heavy lightning storm. How do you increase your chances of winning in the lotto? Putting more money in. If you increased your amount by 5 times to $50, the probability of winning is 0.0000130263288 or, 1 in 76,767 chances. Still, those odds are pretty far off. My friend has been playing the lottery for at least 10 years, maybe more. Under that premise, and since I'm a trader, let's see what could've happened to the money he used to play the lottery which he's had no real return on. Yes, he may have won $100 or so cumulative. Can't remember what he said. He puts $10/wk in a savings account for the 36 months. Let's say there is no interest. At the end when he closes his account and opens a cash only options account at BrokersXpress, he has $360. Every month for the remainder of the 7 yrs left, he continues to add $10 of what he would've put in the lottery into his BX account. The minimum opening account is $200. During those 36 months, he takes time to learn how to trade options. Yes, this will cost money, but he has a different account where he saved up money from giving up coffee for 5 years prior. He was spending $3.50/day every day. In 5 years with no interest, this equates to $6370. Every month he puts about $106 into his training/education (that's his coffee fund). At the end of these 3 years of training, he's spent $10,192 to learn from the right people BEFORE investing a dime into any trades. Initially, you can't buy options like GOOG or any of those, but he has to by inexpensive options of lower priced stocks. He makes only 1 trade a month with commissions at $14.95/trade. Yes, he can probably get lowered commissions elsewhere for options with a small starting account of $360. But, I don't know those brokers, so I'm using only what I know. Since his account is so small, he doesn't have negotiating power to reduce his fees right now. Also, during his training, the limiting beliefs on money, relationships, success, etc. were resolved. He developed good habits of money & trade management, did at least 2 yrs of simulated real time, end of day trading. He's learned to manage his emotions and has good money habits of discipline, self-control, organization and does not have a get-rich quick scheme mindset. Let's say he makes now 10% on his money each month before commissions. Initially, he's just making 1 trade a month. He doesn't increase to 2 trades/month until he's bringing in $200 profits before commissions. This doesn't happen until month 67 of when he started saving the $10/month to invest. By now, his account is up to $3,477.34. Basically from month 37 to 67, he's only making 1 trade/month. That's basically 2.5 yrs he's been able to form good trading disciplines, self-control, managing his emotions. Because he is wise with his money, he's also been looking for a different broker that has better tools and commissions, he decides to switch to a broker that will charge him only $1.25/contract/trade. He's significantly reduced his commissions from $29.90 roundtrip for 1 contract to $2.50. I actually pay less than this, but we'll say for the sake of this example. During these 30 months, he's spent another $3185 in training/help to better himself in trading. The total is now $13,377 in education in trading, rather than learn the hard way. He continues to make 10% on the total of his account, only adding another contract when he makes an additional $200. In month 86, he's making nearly $2K a month and up to 10 contracts. His account is up to $21,224.87. This is now 7 yrs down the road since he began his trading education and just a little over 4 yrs since he started actually funding any trades. Mind you, the $10/month investment at month 86 = $860. He's made a little over $20K AFTER commissions. At the end of his 10 yrs of investing in the lottery, he has nothing to show for it but to be bankrupt and in debt. If he had been smart and taken this route, he would have conservatively near a 1/2 million. Even if he stopped at Year 9, that's still a lot of money. Though I do not play the lottery as my friend, I've had my own bad choices with money, trading, etc. I did not have the patience and learned the hard way on MANY things in trading, wiping out my accounts multiple times. It's sort of like the Tortoise & the Hare. There were areas I took my time to learn properly, but other factors impeded me like impatience, lacking of knowledge and understanding, wanting to go faster than where I actually was mentally/emotionally. Pride!! (Yes, the Bible says pride comes before a fall and boy, did I fall hard). Anyway, this is long enough. I'll have another article that expounds more on some of the mindsets here.